About me | Just Visit Siena ! a lawyer by profession; lives in Siena. But since childhood she has a great passion for foreign languages and travel. And you can be sure that this will never change! Because she wants to know and see more and more. . . However she knows very well that SIENA will always be for her the most special place. Formation this site it is very gratifying for her. She strongly believes that it will be soon an unique source of information. If you like my blog, I will be very grateful when you follow it. Thank you for dropping by my blog. I love Siena. Saw it first just before I got married and have gone back several times since. thank you very much for such nice words 🙂 ! have a sunny Sunday :)! Not been to Siena but you write so engagingly that it encouraged me to look it up. Keep in touch. Thanks for stopping by my blog. We just recently visited your area and I’ll be sure keep an eye on your blog for planning our next visit! Thanks for visiting my blog. Siena looks beautiful I hope to go there someday! thank you very much 🙂 !! Cheers from Siena :)!! Love your blog. So many great ideas for places to visit. Thanks for the like. I’ve decided to follow your blog so I can further indulge my life time romance with Italy via your great photos. Thanks for stopping by my photo blog and liking some images. Have a great day! Been to Florence, but couldn’t make it to Siena. Would love to visit some day. Thanks for the like and follow :). Very cool blog, I haven’t yet made it to Italy during my travels but I hope to soon! I will for sure visit the places you have highlighted, especially Siena! It looks really beautiful. Take care! I’ll be in Italy In August and September! Spending weeks and weeks with a country I’ve only heard about. I’ll try to get some tips from your blog. Thanks! Thank you for producing this inspiring blog that gives me so many ideas of places I would love to visit! Looking forward to enjoying more of your posts. Thank for your like in my blog, nice..
You are welcome! it is a pleasure for me! Thank you for the like. Even though i have lived in Europe the last one year and more i couldnt make it to Italy yet. but i sure will one day! All the best! You are welcome 🙂 my pleasure 🙂 great post 🙂 have a sunny day! You are welcome 🙂 pleasure for me 🙂 I am glad that you like my blog! have a great weekend :)!! Thanks so much for liking my posts. I love to travel, and hope to one day visit your fair city! You are welcome 🙂 my pleasure! wish you to visit Siena then :)!! Love your blog. Thank you for visiting mine and for the follow. I will be following yours. I visited Lucca but did not get to visit Siena. It is next on my wish list. I loved Firenze and wish I had more time there. Thank you for your comment 🙂 I am glad that you like my blog! So wish you to visit Siena next time 🙂 ! Thank you so much for stopping by my blog 🙂 I have never been to Italy (I was only recently bit by the travel bug), but I will certainly be visiting Siena one of these days! Thanks for stopping by Elle & Pear! Siena looks beautiful, I hope to be able to visit! Thanks for dropping by and liking my latest post – Love Siena was there a few years ago for a visit – only 1 day and it was too short – can’t wait to return to Italy and explore even more! You are welcome 🙂 🙂 Thank you for your comment! I am glad that you like Siena 🙂 wish you to visit again soon! Hey Magdalena, love your blog.Sienna and Italy in itself are on our bucketlist. Hope to get there some day. I visited Siena about 6 years ago and loved it. Would love to go back again. Thank you for dropping by my blog! I was going through your posts and your pictures make me want to visit Siena so bad! It looks so beautiful! Thank you for visiting my blog. 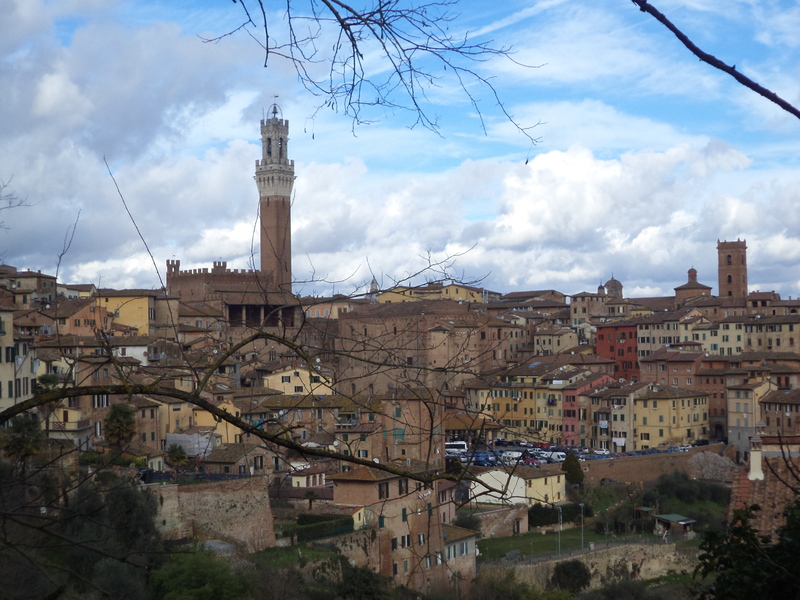 I haven’t made it to Europe yet, but I’m happy to visit Siena through your blog. grazie ! e buon weekend ! Thank you for liking my recent post. I look forward to reading more of your posts about Siena. It is truly a special and beautiful city — and that is really saying something in Italy!